You’ve seen anecdotal evidence of tech changes in small business: The farm stand that now accepts credit cards with Square; the independent coffee shop with an iPad point of sale register; the third-generation family-run five and dime with an e-commerce platform. According to a recent small business owners survey, such changes are widespread. 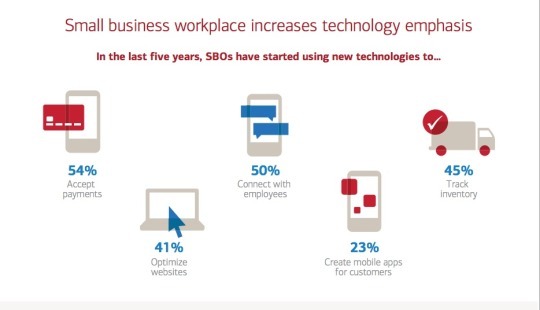 Half of small business owners told Bank of American that they have invested in new technology over the past five years to better connect with employees, while more than one-third said technology has reduced their need for employees. Nearly three in four report that they invest in technology upgrades one or more times per year. Nearly a third upgrade quarterly. In another tech-reliant shift, nearly half of small business owners now offer telecommuting options – a 12 percentage point jump from five years ago – and most report positive impacts such as better employee attitudes (59 percent) and increased productivity (54 percent). Some expressed concerns, however, that telecommuting makes employees unreliable or inaccessible (34 percent), or harder to trust (33 percent). SMBs aren’t just adopting tech. BofA’s survey shows that a small percent of them are adopting tech startup tricks for keeping employees happy, such as designating areas where workers can relax or unwind such as nap pods and game rooms (20 percent), offering pet-friendly work environments (11 percent), or establishing onsite gyms and fitness classes (8 percent). These business are also feeling the burden of security risks that come with increased digitization. More than one in 10 small business owners reported that they have been the victim of a cybersecurity breach. More than half expressed concern over protecting their proprietary data, and two-thirds have taken measures to be prepared for a cyber-attack.